A university cleaner has been on holiday to Jamaica after students donated £1,500 so he could visit family for the first time in a decade. About 230 University of Bristol students crowdfunded the week’s trip for Herman Gordon and his wife Denise. A video of the cleaner breaking down in tears when he was told about the trip in June went viral. 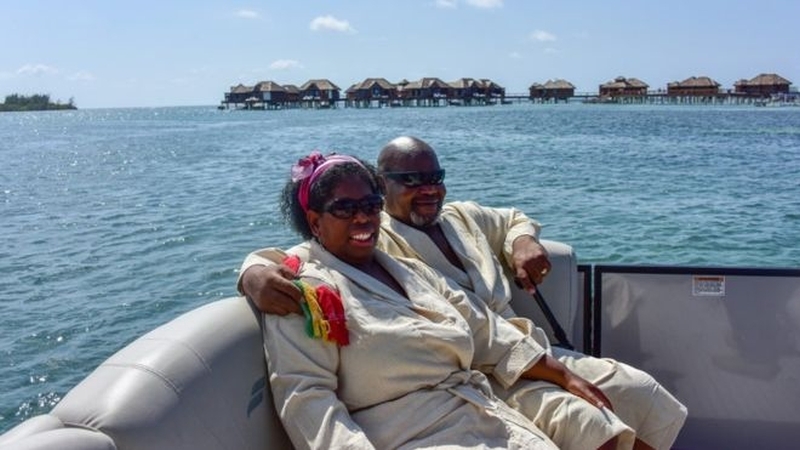 Mr Gordon, who has worked at Bristol University as part of the cleaning staff for 12 years, stayed at the Montego Bay resort with his wife. Mrs Gordon thanked students “for this gift that they have given to me and Herman”. The initial post called Mr Gordon “the jolliest man I have ever met” and said “if you wanna reason to smile, go talk to him for a min or two”. A day later, Hadi Al-Zubaidi, a 20-year-old medicine student at Bristol, anonymously posted that he was starting a crowdfunding page for him. The target was reached in a week. Details of the Gordons’ trip have been shared on the Bristruths Facebook page, where the idea to help Mr Gordon first materialised back in May. “We’re delighted to say that Herman loved his holiday at a five-star resort in Jamaica along with his wife Denise,” a post said.